Start out with your roast. Since we slaughter a cow every year, I never know exactly how much my roasts weigh. It's never caused problems before, so take the 3lb thing loosely. 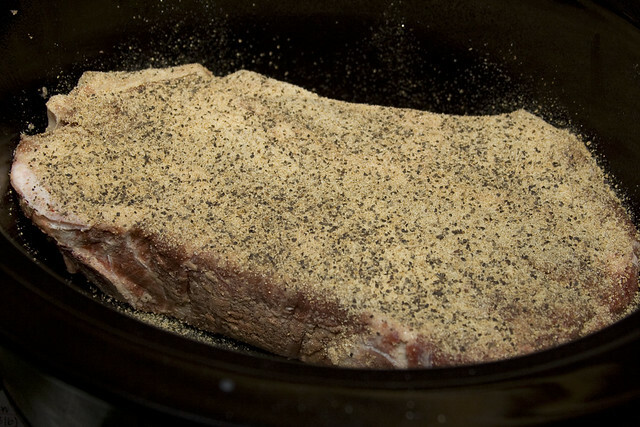 Place the roast in the crockpot first. Disregard that my pepper is in a "spanish paprika" bottle. The pepper bottle was busted, so Drew improvised. It works, and that's all that matters, right? 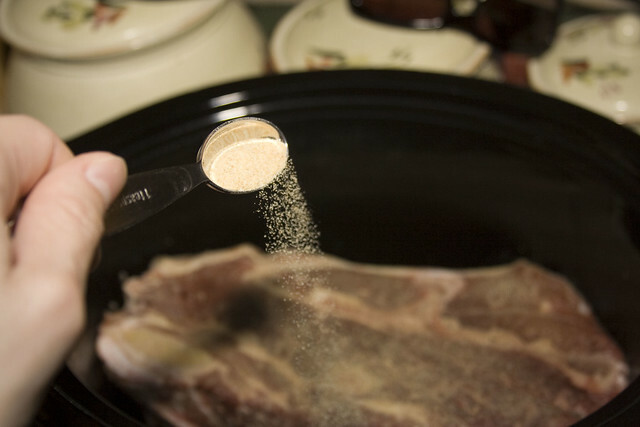 You'll want to sprinkle the roast with the garlic powder, onion powder & salt and pepper (I use Lawry's season salt instead of plain table salt). It'll look like this when you're finished. 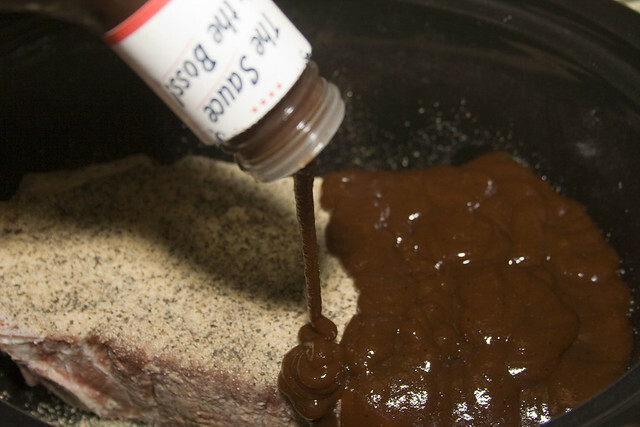 Next, cover your roast completely with the bbq sauce. Any bbq sauce will work. 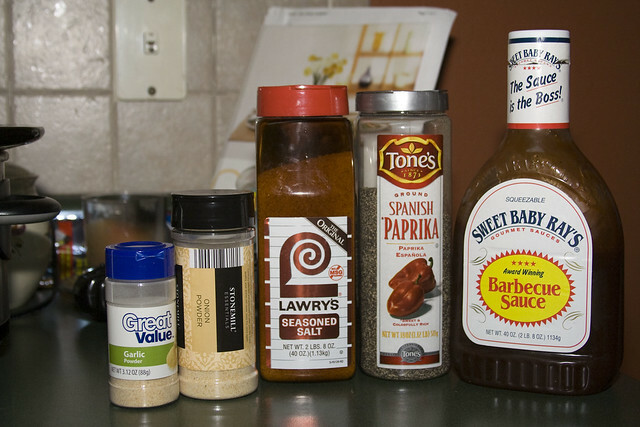 We happen to have a TON of this type of sauce on hand, so that's what I used. Cover her up. 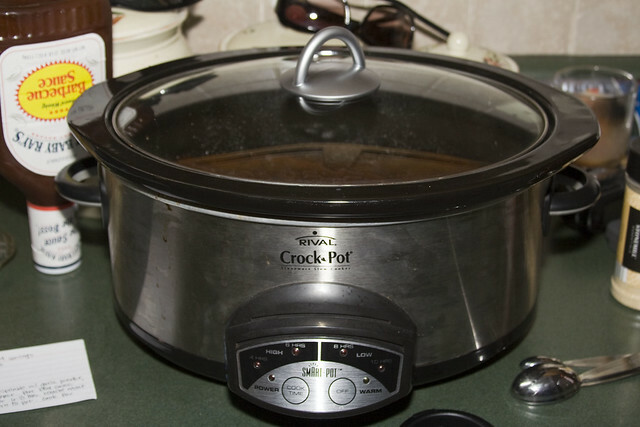 Cook on low for 6-8 hours. 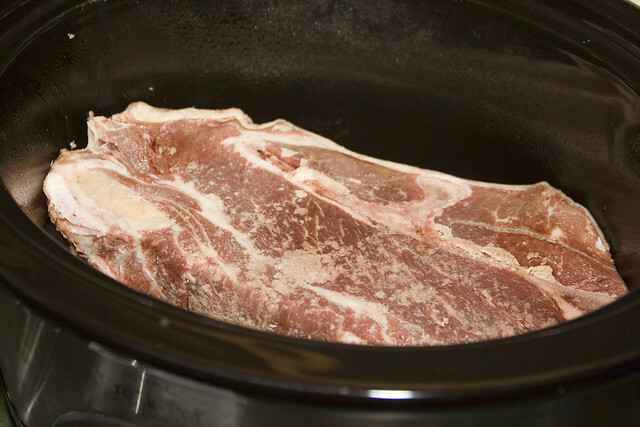 Remove meat when done, shred, and return to crockpot, cooking for approximately 1 more hour. travesty. Trust me when I tell you, it looks, smells and tastes SCRUMPTIOUS! We serve this on 100% whole wheat burger buns. You can use any old bun though. Or hoagie. I like cheese on mine, but that's not necessary either. This serves about 4-5, depending on your roast size.